Subject: Night Duty Allowance (NDA) –clarification regarding fixation of ceiling of pay for entitlement-regarding. A copy of OFB Instruction bearing No. 3519/2017/PER/POLICY and letter No. 658/NDA/Per/Policy dated 21/11/2017 on the subject matter is forwarded herewith for information and necessary action please. 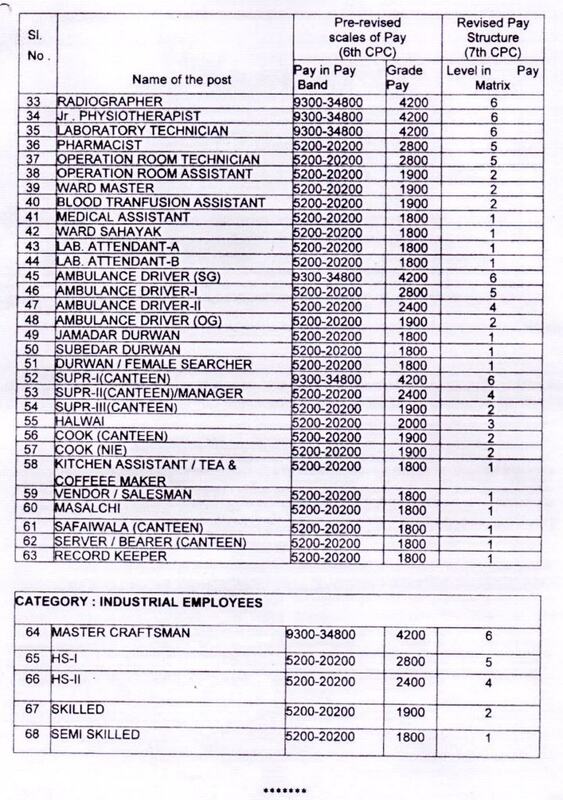 Sub : Night Duty Allowance (NDA) — clarification regarding fixation of ceiling of pay for entitlement - regarding. Ref : i) MoD ID No.17(4)/2012/D-(Civ-11) dated 07/07/2017. 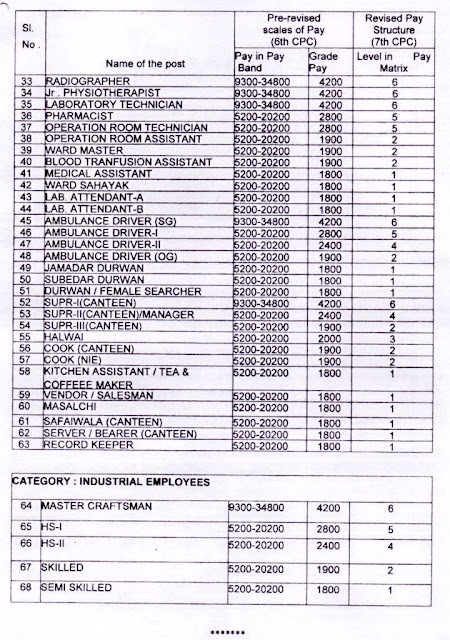 Attention is drawn to OFB instruction/circular cited under Ref(ii)&(iii) above wherein the sanction for payment of NDA at revised rates (as per 6th CPC pay) to the eligible civilian employees working under MoD was conveyed. 02. However, owing to the confusion over the ceiling of pay for entitlement/eligibility of employees for grant of NDA, the matter was taken up with MoD for a clarification. Now, MoD vide Ref(i) above, considering the provision in the DoPT OM dated 04/10/1989 that there shall be no ceiling for entitlement of NDA in respect of such officials who were getting this benefit at that point of time as per extant criteria, has advised OFB to issue a one-time order specifying the designations/categories/levels of non-gazetted employees who were getting this benefit of NDA in accordance with extant instructions, so as to ensure their seamless deployment at night shifts and payment of NDA based on current pay. 03. 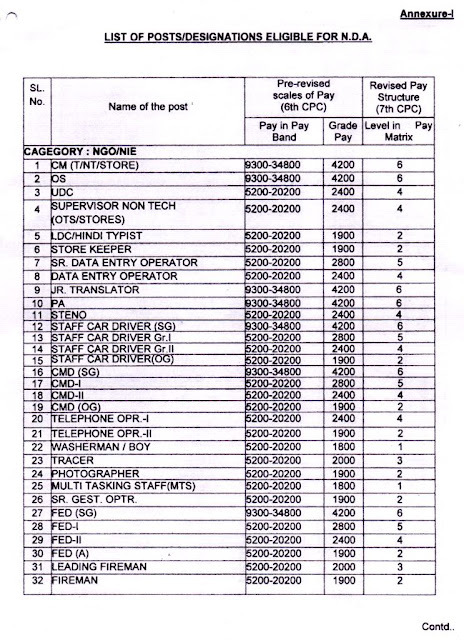 In view of the above, it is hereby indicated that all employees in the category of lEs/NIEs/NG0s, as per list enclosed at Annexure-I, are declared eligible for grant of NDA based on the revised pay and allowances as per 6th CPC pay scales, without any ceiling, till further order in this regard. However, all other terms and conditions laid down in OFB instruction/circular cited at Ref(ii)&(iii) shall remain unchanged. 04. This issues with the concurrence of PCA(Fys), Kolkata vide letter No.Pay/Tech-II/ 2016 dated 18/10/2017.